Look up at the sky on a clear night, and you’ll see lots of stars. Sometimes they seem almost within reach or at least a short rocket ride. But the closest star to Earth—not counting our sun—is more than four light years away, at a distance of 25 trillion miles. 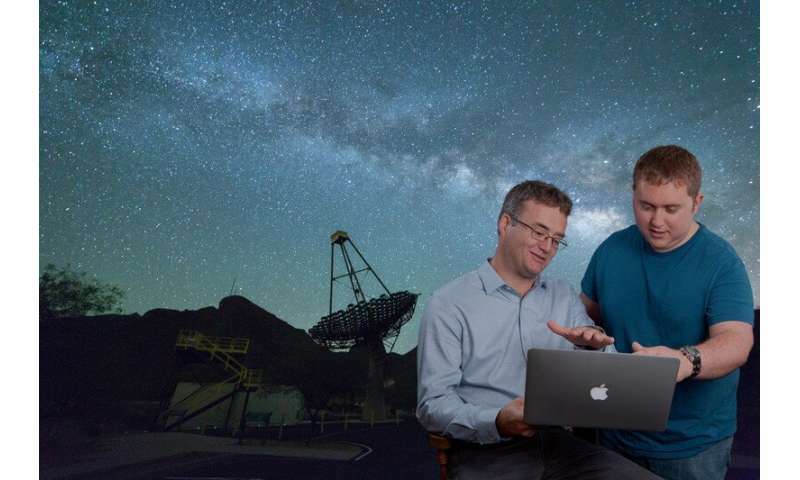 But now an international team, including researchers from the University of Delaware, has discovered a new way to determine the size of stars. Their method draws on the unique capabilities of the Very Energetic Radiation Imaging Telescope Array System (VERITAS) at the Fred Lawrence Whipple Observatory in Arizona—and asteroids that pass by at just the right place and time. Using the technique, a collaboration of 23 universities and research institutes, led by Tarek Hassan of Deutsches Elektronen-Synchrotron (DESY) and Michael Daniel of the Smithsonian Astrophysical Observatory, has revealed the diameters of a giant star 2,674 light-years away, and a sun-like star at a distance of 700 light-years—the smallest star measured in the night sky to date. The research was reported on Monday, April 15 in the journal Nature Astronomy. 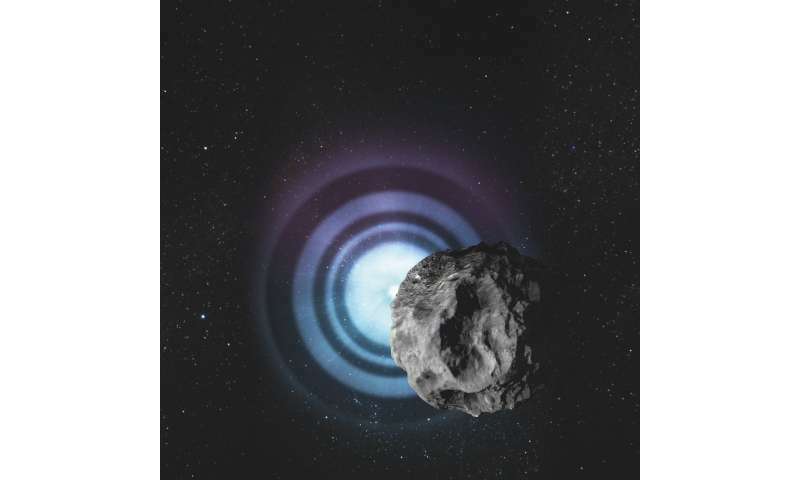 In this pilot study, the object passing in front of the star was an asteroid—a bit of space rubble likely leftover from when the planets were formed about 4.6 billion years ago. Asteroids travel at an average speed of 15 miles per second, which added to the team’s challenge. Normally, the VERITAS telescopes watch for the faint bluish blip that high-energy cosmic particles and gamma rays produce when they race through Earth’s atmosphere. While the telescopes do not produce the best optical images, they are extremely sensitive to fast variations of light, including starlight, thanks to their huge mirrored surface, segmented in hexagons like a fly’s eye. Holder was involved in the construction and commissioning of the telescopes in 2006, and all of the light sensor modules for the four telescopes were assembled at UD. The researchers repeated the feat three months later on May 22, 2018, when asteroid Penelope with a diameter of 88 kilometers occulted the star TYC 278-748-1. The measurements resulted in an angular size of 0.094 milliarcseconds and a true diameter of 2.17 times that of our sun—the smallest star ever measured directly. On Jan. 2, the New Horizons spacecraft made the most distant flyby ever attempted, successfully returning images of the Kuiper Belt object Ultima Thule. While the world is agog at the so-called “snowman” shape of this icy asteroid, the concept is nothing new to PSI scientist and artist, Bill Hartmann. The figure shows paintings that Hartmann made from 1978 to 1996, to illustrate the possible outcome of very low-velocity collisions of distant asteroids. These are compared with the first released color image of Ultima Thule. The story goes back 50 years. Hartmann became intrigued with how such bodies might have formed in the primordial solar system by low-velocity collisions of asteroidal bodies, from which the planets were growing. These still-theoretical bodies were called “compound binary” asteroids – “binary” meaning two bodies, and “compound” indicating that they were touching each other, instead orbiting around each other. PSI’s Stu Weidenschilling published a paper on how the shapes of the two halves of the compound binary might have their shapes distorted, depending on their bulk strengths and the rotation rate of the object. Hartmann’s 1978 painting showed the compound binary concept with grey colors as found on the Moon. No such bodies had been seen at close range, but Hartmann wanted to depict them. “My astronomical paintings are not just flights of fancy, but a serious attempt to make something both beautiful and realistic out of what we humans have learned about other worlds,” Hartmann said. By 1980, Cruikshank and Hartmann had shown that many bodies in the outermost solar system had a dark, reddish brown color, and his 1980 and 1996 paintings added Hartmann’s estimate of how this color might look. Ultima Thule was not only the first obvious example of a compound binary structure, but also looked strikingly like Hartmann’s 1996 visualization from 22 years ago. Hartmann happily notes that his 1978 and 1996 paintings show bright material in the “contact zone” where the two bodies collided, and sure enough, the New Horizon spacecraft photo also show bright material there. Join the movement and be a Planetary Defender! There’s no time to spare… ! And with your help, the Society is gearing up to do its part. There are many things we can be doing to help protect against asteroid threats and we want to give you awesome artwork that helps you spread the word. Please read more and share this link.